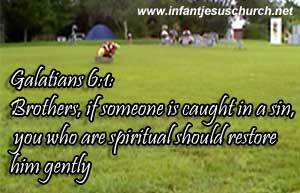 Galatians 6:1: Brothers, if someone is caught in a sin, you who are spiritual should restore him gently. But watch yourself, or you also may be tempted. We have to bear one another's burdens, that is what says today's verses. We shall fulfill the law of our Lord Christ. This obliges to mutual forbearance and compassion towards each other, agreeably to Jesus' example. This becomes us to bear one another's burdens, as family member or co-traveler. It is very common for a man to look upon himself as wiser and better than other men, and as fit to dictate to them. Because we fear being branded judgmental and self-righteous, we let many who are trapped by sin go to their spiritual deaths. Like that one deceives himself, by pretending to what he has not, he puts a cheat upon himself, and for others and sooner or later will find the sad effects. Every one is advised to prove our own work. The better I know our own hearts and ways, the less shall I despise others, and the more be disposed to help them under infirmities and afflictions. How light soever men's sins seem to them when committed, yet they will be found a heavy burden, when they come to reckon with God about them. No man can pay a ransom for his brother; and sin always is a burden to the soul. It is spiritual burden, and the less a man feels it to be such, the more cause has he to suspect himself. Most of us are dead in our sins, and therefore have no sight or sense of the spiritual burden of sin. Feeling the weight and burden of our sins, we must seek to be eased thereof by the Saviour, and be warned against every sin. Heavenly Father, forgive my sins as we forgive those who have sinned against us. But Father, please help us to recognize the many different ways we may serve you, and help us to not let one of them go unused. also help our heart to be gripped by the gravity of sin's effects and to be stirred into action to help those whom it has trapped. Through Infant Jesus always, who came to rescue me from our sin, who is the Prince of Peace we pray. Amen.